Whilst hunting for presents for cat mad family and friends I came up with the idea to buy some cat themed jewellery. However, I do know that certain friends are allergic to some metals so what better than a cat pin? It does not need to be worn against the skin and is perfect for young and older friends. They are even great for pinning onto backpacks. 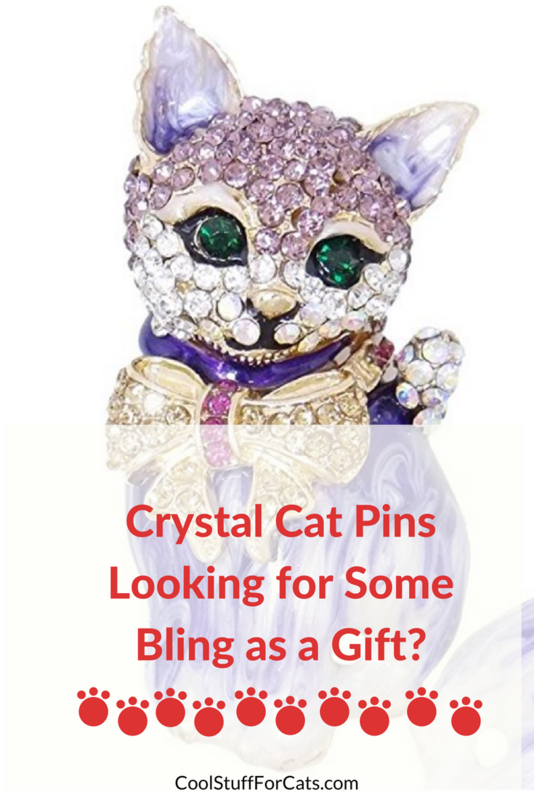 I have a few friends who love crystal so I decided to look at crystal cat pins. 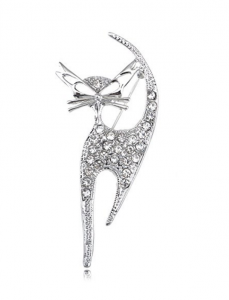 If you are looking for cat brooches with less crystal then see our list here. And what a great range I actually found. This Swarovski crystal brooch actually made me laugh a little. 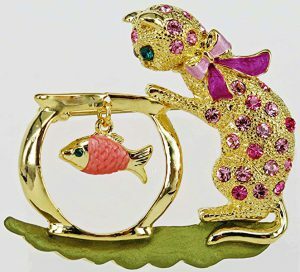 You have a gold tone cat with beautiful green eyes and a pretty pink bow encrusted with rose colored swarovski crystal. And playfully he is gazing in anticipation at a pink and gold fish in a bowl. This is a nice size pin at 1.8 inches by 1.65 inches and it is 20K gold plated. The Swarovski crystal is in a light rose and a slightly darker rose color. If giving as a gift then it comes in a black velvet pouch. This amusing crystal cat brooch is currently available here on Amazon. This immediately caught my eye as the cat looked so cute with its little bow. It also came in a selection of lovely colors with the body of the cat delicately painted. Austrian crystals then encrusted the head and bow. Size wise this pin is just the right size for a lapel and is not heavy enough to rip light fabric. It is 2.3 inches in length by 1 inch in width. There is a color to suit everyone. Whilst I usually love blue I was also really drawn to the purple color with this pin. It is also perfect to give as a gift as it comes in a lovely presentation gift box and bag. It looks a lot more expensive than it really is. This is a great pin to give as a gift to your daughter. Especially if they have a school mascot that is a panther or other large cat. This pin is in the shape of a cat (or dog) paw and is filled with sparkly rhinestones. These are diamond cut crystals which then radiate the light to give extra glitter and shine. This brooch is two inches by two inches in size and would look great on a school bag, kit bag or even a lapel. It comes in three colors – black, clear and a topaz orange. My favorite color is the topaz orange for this pin – which is your favorite? 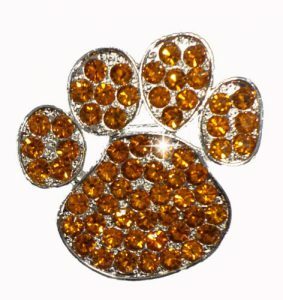 Have a look here on Amazon for more details about this sparkly cat paw pin. This regal looking cat pin is by Alilang. It is a pretty art deco looking piece in a silver tone metal and with clear crystal cut rhinestones. This cat pin has a very delicate look and has a cool looking cut outs for its eyes and ears. 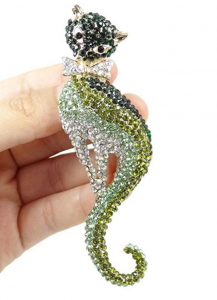 The body is full of rhinestones and it has a really pretty long and arched tail. This pin would look great on a scarf or dress. It is a great gift for a cat lover or someone who likes rhinestone brooches and pins and it gets delivered in a smart gift box. Overall it is around 2 inches in length. Look here on Amazon for more details about price and delivery. This pin is such a pretty color. While the metal is in a gold-tone the crystals are in varied green colors which give the cat body a feeling of depth. The colors are an emerald green through to a peridot green color and finally a chrysolite color together with some beautiful clear crystals. This pin really does sparkle and is definitely blingy. The cat is about four inches in length and just over an inch wide and it is completely encrusted with crystal. This cat also has a beautiful long curled tail which almost resembles a sea horse. This cat pin would make another great gift as it comes in a pretty gift box which also contains some extra crystals. Our final pin has two pretty kitties hugging each other like best friends. This can be a beautiful special occasion gift for your cat loving friend or relative. It can be perfect for mothers day. One cat is gold plated with a crystal collar. 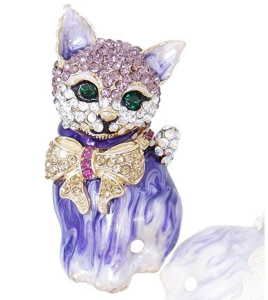 Whilst the second cat is rhodium plated with clear colored crystals encrusting the body and head. The cat’s paws and tails are then intertwined. The crystals themselves are clear diamante. This is a very sweet looking pin and measures 3.5 inches long by 3 inches wide.